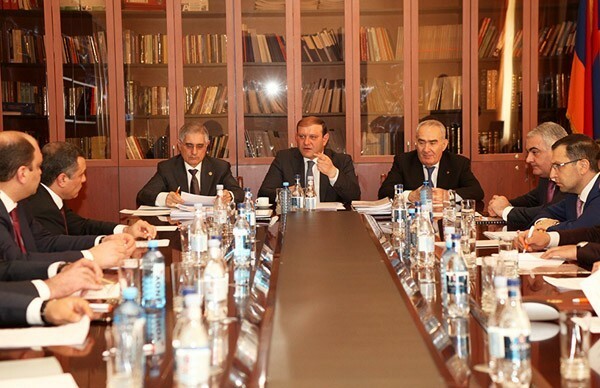 Chairpersons of Councils of the Yerevan Territorial Organizations of the RPA submitted reports to the Executive Body of the Republican Party of Armenia (RPA). The venue was the central office of the RPA. Republican Party of Armenia (RPA) Executive Body member, Yerevan Mayor Taron Margaryan, RPA Executive Body member, Republican Party Deputy Chairman, Chairman of the Council of Elders Galust Sahakyan, RPA Executive Body Member, Chairman of RPA Organizing Committee Ruben Tadevosyan were present at the consultation. Taron Margaryan, coordinator of the RPA Territorial Organization's activities in Yerevan, highlighted the work carried out with each member of the party as well as active public activities. In the end of the meeting, participants also discussed the plans and upcoming activities in 2018.